Survey Junkie Complaints are on the rise. Better bring your time elsewhere. It is a very recent trend that I am hearing and reading about Survey Junkie complaints everywhere. They used to be a hot favourite among their millions of users, but things seem to be going downhill these days. Here I uncover the truth about what is happening with Survey Junkie, and explore some other online opportunity that you may want to consider, which will earn you much more than the peanuts you get from any survey platform out there. Survey Junkie, like any other survey platforms, provides you the opportunity to earn some pocket money by completing surveys. It is a legitimate site, but in recent months it has been receiving more and more negative reviews from its users. And it is not going to make you a millionaire anyway, even if you take surveys full time. 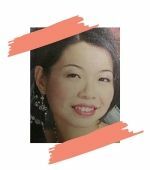 So maybe it’s time to explore other online opportunities, instead of letting Survey Junkie zap away your time and energy, and leave you feeling frustrated. 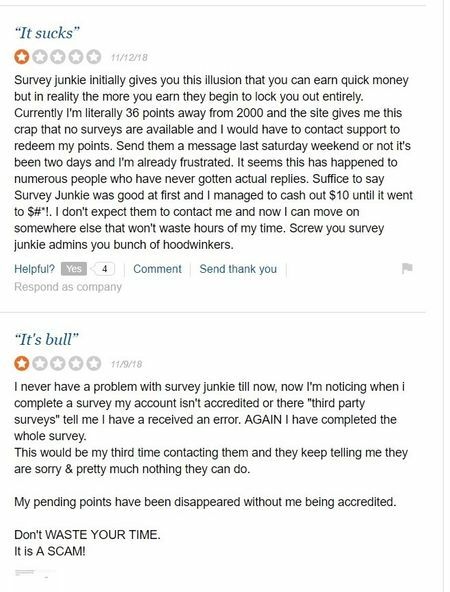 Read on for the detailed review of Survey Junkie, and why I do not recommend it. 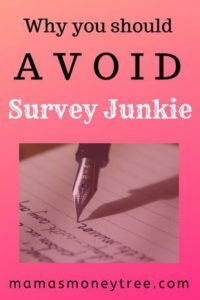 I started off intending to write a good review of Survey Junkie, as I know it to be a very well-established and popular survey site, with great track records in terms of customer satisfaction and payment terms. But as I dug around doing my research on it, I was quite appalled at the amount of negative reviews that showed up. As I probed deeper, I decided that to do justice to my readers, I have to bring this to light, to warn everyone not to waste anymore of their precious time on this survey platform whose behaviour and interactions with its users is becoming more hooligan or crook-like. Still, let’s try to take an objective look at the platform and how it works, before revealing what its users have to say about it. Signing up is an easy process (oh, by the way, it is only available to people in the U.S., Canada and Australia). Once you complete the registration process, you get 25 points! 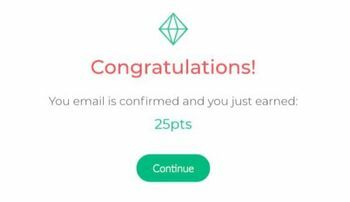 Go on to complete your profile, and you get to earn more points. One thing to take note is always be completely truthful when completing your profile, because the survey site will assign surveys to you based on those information. If the profile information is not accurate, it will show up as you are doing the survey, and you may get disqualified half way through it, which means time wasted. The main method to make money with Survey Junkie is to complete surveys. You will receive notifications of surveys that are available to you, with the points that will be awarded upon completion, and the estimated time required. 100 Survey Junkie points is equivalent to $1. To cash out, you need a minimum of 1000 points (which is $10). You can cash out your points via your PayPal account, or through electronic gift cards. The gift cards are for popular brands like Amazon, Target, Starbucks, and more. This minimum amount of $10 required before you can cash out is rather low, when you compare across all other survey platforms. This is one something I really like about Survey Junkie. There are other platforms that need you to accumulate $30 worth of points before you can cash out. Many people give up simply because it takes too long to get any tangible reward. But the thing with Survey Junkie is that the first cash out or so is usually done without any problem, giving you the impression that their payment system is fair and efficient, leaving you a happy customer. But subsequently when you try to cash out more, that is when the nightmares start to come in. We will take a look at this in the next section. There is a second way to earn money in Survey Junkie: join their focus groups. You have to first meet their requirements, as they do have certain demographic criteria, depending on the conditions set by the company that asked to form the group. Once you are in, you get to express your opinions in a slightly different way from the conventional surveys. The earnings are higher too. So definitely try to find your way into some focus group and try it out. With this platform, if you clock in 20 minutes a day to do surveys, for 30 days in a month, you would likely be $50 to $100 richer in that month. You can consider it good coffee money, but I think it is definitely not worth the time. There are much bigger things that you can do in this time, that build your path towards financial success in the online world. This estimated earnings is not even considering the seemingly scammy behaviour that Survey Junkie has turned to recently, that may blatantly cheat you of your earnings. 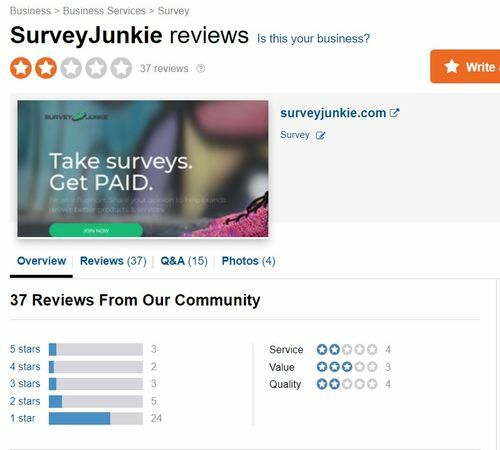 On this review site, the vast majority of the users gave Survey Junkie the lowest rating. Many complaints have got to do with not being able to redeem their points because they had problem with the verification process. To me, this is extremely unethical because the users had already completed those surveys, and even accumulated enough points to cash out. Survey results must have been delivered to the companies. Email verification was the very first thing that was done upon any new signup. What nonsense is it that only when users try to get their hard-earned money then they are faced with verification problems? This is outrightly dishonest. No doubt, the number of complaints is still the minority of Survey Junkie’s users, but that is only because they have millions of users. It is a fact that negative reviews about their payment process are sprouting up everywhere, a lot more in last year and this year than ever before. So instead of subjecting yourself to this kind of hassle and stress about not being paid out fairly, why not take your time to somewhere else? Even if it were a fantastic platform, no surveys in the world can ever let you quit your job and earn a passive income. No surveys can let you earn while you sleep. How about shifting gear from chasing after a few small bucks, to building up something from scratch, that can eventually allow you to lead a laptop lifestyle? It is a good way to earn a few dollars if you have some little pockets of spare time here and there, half an hour on the train commuting to work, it’s a productive way to spend your time, rather than doing nothing. It is simple and convenient. At the minimum of $10 cash out amount, it is relatively low compared to some other survey platforms. So that makes you more motivated to work towards this easy target, so you can get some tangible rewards. This point itself is enough to make me just turn and walk away from them. When a business starts to exhibit dishonest behaviour, it gets stressful and draining trying to fight for your well-deserved payments. It’s not worth to pull out more hair over a few dollars. If you are facing any issues with the cash out or verification process, I would say, just let it go, get out of there, and do something bigger and more productive with your life. There is no mobile interface for this survey site, so using it with your mobile phone may prove to be a bit awkward. It is more user-friendly when accessed from a computer. Is Survey Junkie Scam or legit? On the bigger scale of things, Survey Junkie is still having a rather good track record. So I don’t think I can call it a scam (yet). 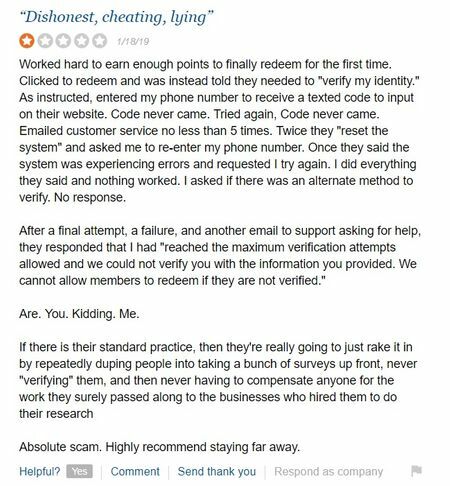 If things do not improve with their so-called verification process, and pay outs keep getting delayed or cancelled, the ending would turn out quite differently. 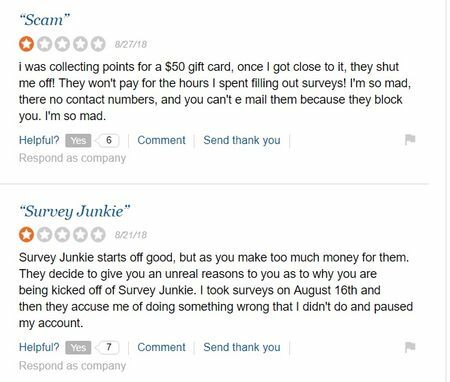 I do not recommend Survey Junkie, because of the complaints it has been receiving. And it is not going to make you rich anyway, so why not better spend your time on building up your very own online business? Given patience and hard work, it can earn you a full time income, depending on where you want to take it. It is definitely not MLM, in case that’s what is creeping into your mind right now. 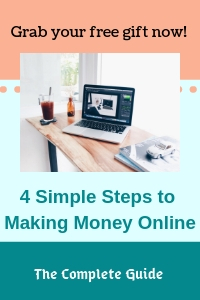 It is about setting up your own website (I did it from scratch, with zero knowledge, so I know anyone can do this), in a niche of your choice. When you make your business center around your passion, it no longer feels like work. Then you build content on it, related to your niche topic. When search engines see that you are creating authoritative content in the niche area, they will rank your website on page 1 of search results, so people searching for certain answers related to your niche will click to land on your site. This way, you get free organic traffic. With traffic, there are numerous ways that you can monetise your website. I am doing it using a simple business model where I do not have to own any products, or deal with any customer feedback or complaints. I am basically free of any capital investment, except for the small amount to set up a website. What is Contenu? A plagiarism tool?